When I opened my package from Taylor Joelle Designs and pulled out the box of tights, I think I might have gasped. One word… ADORABLE!!! I received the Sassy Tights set of two which retails for $22.50. They are 80% cotton, 15% Polyester and 5% Spandex. Babies rarely keep their shoes on and these tight are made to look like they do have shoes on. 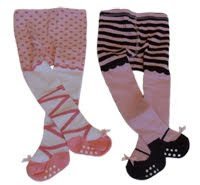 My favourite was the ballerina style ones that have the criss cross look up the leg in pink and a little boy at the bottom. How cute!!! These would make fabulous gifts for any baby girl. They come in sizes 0-6 mths or 6-12 mths. Visit www.TaylorJoelle.com and see their other products such as crib bedding and blankets, shoes, socks, and even jewellery. They even have free shipping with an order $35 or over.